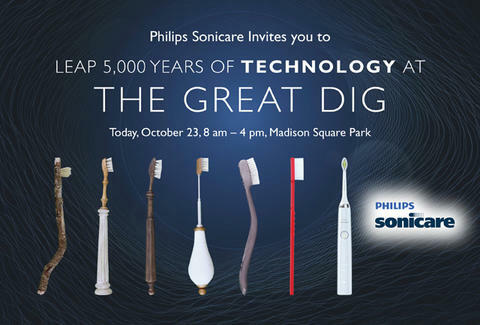 WHAT: Breaking News: Prehistoric dental hygiene tools found in New York’s Madison Square Park! Wait, no, they’re just manual toothbrushes. Check out the Great Dig to join Mike Wolfe (American Pickers) for a peek at the next generation of tooth-cleaning tech, starring the Philips Sonicare DiamondClean. Unearth outdated fossil brushes and other antiquated technology for a shot at prizes. WHEN: Today, 8:00am – 5:00pm WHERE: Madison Square Park New York, NY WHY: Because you don’t use 8-tracks, papyrus tablets, or the Pony Express anymore -- time to get with the program and ditch ye olde toothe-brush.